Several Republicans — including presidential candidates Marco Rubio, Jeb Bush and Carly Fiorina — have claimed that business deaths outnumber business births in the U.S. That was accurate for individual firms for 2009 to 2011, in the wake of the Great Recession, but no longer. According to the Census Bureau’s September 2015 release of these figures, firm births outnumbered deaths in 2012. And the same goes for 2013. The source of this claim is a Brookings Institution report from May 2014 titled “Declining Business Dynamism in the United States,” which found that “business deaths now exceed business births for the first time in the thirty-plus-year history of our data.” That’s according to data from the Census Bureau’s Business Dynamics Statistics through 2011. The numbers showed that firm exits outnumbered firm entries in 2009 for the first time since this information was collected in the late 1970s. That was also the case for 2010 and 2011. The Brookings report looked at “firm” startups and closings, rather than “establishments,” which Census also measures. Firms are individual businesses, while establishments include multiple outlets for existing firms. The Brookings report specifically discussed entrepreneurship, which is why it used the numbers for firms. “The distinction between a new Chase Bank branch opening in your neighborhood versus a brand new community bank is critical — particularly when studying entrepreneurship,” Ian Hathaway, one of the authors of the report, told us via email in May, when we first looked at this claim. Hathaway also sent us a chart with what was then the most recent data from Census, released in September 2014, that showed firm deaths in 2012 (424,864) still outnumbered births (410,001). That’s a difference of 14,863, and the figures showed that the gap had been narrowing each year since deaths first outnumbered births by 90,670 in 2009. We, in fact, cited those numbers in writing about Fiorina’s claim in the Oct. 28 debate. But, it turns out, Census had released new numbers for 2013 in September of this year. And in doing so, it revised its figures for past years. 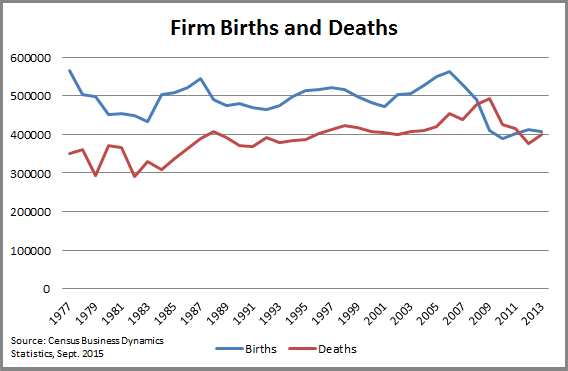 The latest statistics now show that in 2012, firm births (411,252) were higher than firm deaths (375,192) by 36,060. But the latest numbers show that more firms are opening than closing, making this GOP talking point now false. Census Bureau, Business Dynamics Statistics data page: The BDS uses longitudinal information on firms and establishments to generate measures of business dynamics and job flows. Since information from multiple years is used to produce a statistic for any given year, having more years of data surrounding the year in question improves the quantity and quality of information used to generate the statistics. Thus, less information is available to generate the last year(s) of any given BDS release. Measures of job flows from firm and establishment births are especially sensitive to this source of measurement error and accordingly are more likely to be revised in subsequent releases. That’s exactly what has happened. Looking at the firm birth and death rates — as opposed to the sheer numbers — shows that what Brookings found was part of a long-term trend. The death rate has hovered around 9 percent for decades, while the firm birth rate has fallen. It was 15 percent in 1978, 10 percent in 1999, and down to 8 percent in 2011, according to Brookings’ calculations. Hathaway coauthored another paper, for the Federal Reserve Bank of Cleveland, in August 2014 that said there had been a shift away from brand-new businesses toward new outlets of existing businesses, a trend that many Americans may have seen in their own communities. “The Shifting Source of New Business Establishments and New Jobs,” Aug. 21, 2014: We find that while new firms have been forming at a slower pace over the past 33 years and creating fewer jobs, there has been a simultaneous rise in the number of new establishments opened by existing businesses (which we will call new outlets). … Markets that used to be served by independent entrepreneurs creating businesses are now increasingly being served by the expansion of existing businesses. Both of those claims were made when the available Census data still supported them. But the House Republican Conference post remains on the website, even though it’s now incorrect. It says that “each year under the Obama Administration, more businesses have shut their doors than opened them,” and that hasn’t been true for individual firms since 2011.